Recently, my Husband and I were invited to a ball at Mansion House in London and Mr B surprised me with an overnight stay in the Savoy Hotel, London. We had visited previously, in fact nearly 6 years ago when we first got together and you could say it was our first “proper” date (yes ladies, if a man treats you to a meal at the Savoy Grill, you know you are onto a winner! I am quite fickle 😊). We arrived quite early as we wanted to make full use of the facilities and walked up Savoy Court (which is the only named street in the UK were cars are required to drive on the right!) and were warmly greeted by the concierge at the door. We were then taken through to the lobby and our bags were whisked away to our room. Whilst checking in, we were offered complimentary tea and coffee and daily newspapers in the most beautiful Victorian grandeur of surroundings. The Savoy opened in 1889 and was the first luxury Hotel in Britain, which included electric lights and lifts throughout the building and bathrooms in nearly every room. 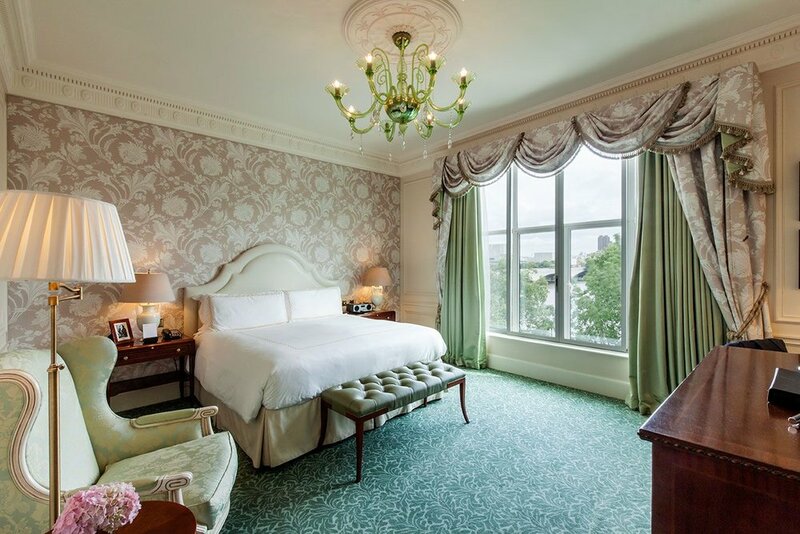 The rich and famous would often (and still do) frequent the hotel and it thoroughly deserves its title of London’s most famous hotel and it’s 5 star status. It sits on the River Thames with easy access from The Strand to London’s West End and Covent Garden. We were shown to our suite and the first thing I checked out was the bathroom! It didn’t disappoint. It was extremely luxurious, with floor to ceiling marble and oversized chrome fittings. There was a large stand alone shower and complimentary bath products from Penhaligon. There was also a sound system from the TV into the bathroom so you could listen to music whilst getting ready. The corridor leading to our room. I was expecting to see twin girls at the end aka The Shining! There are 200 guest rooms at the Savoy and 67 Suites, with each one being individually decorated to an Edwardian or Art Deco style. We stayed in a Deluxe King room which was Edwardian in style and although a little dated to my tastes, it worked really well within the Savoy. The room had an extremely comfortable king size bed, large flat screen TV, seating areas to either sit and read or write, a fridge stocked up with everything from water to champagne and a balcony overlooking the Courtyard. Once we had settled into our room, we decided to check out the rest of the facilities that the hotel had to offer before our night out at the Ball. The Savoy has 4 restaurants which provide a wonderful variety of different menus. The Thames Foyer is in the heart of the Hotel itself and has a beautiful glass dome in the middle of the room, flooding the foyer with natural light. There is a grand piano in the middle of the dome and this is where you can enjoy the world famous Afternoon Tea at the Savoy. The Queen! A Savoy guest. A waiting area in the Women's Bathroom. Look at that mural wallpaper! Kaspar’s was truly a stunning setting, drawing from the design and decadence of the twenties and thirties with an Art Deco theme. The furnishings included teal arm chairs and gold details, luxurious light fittings and mirrors reflecting the natural light that floods in from the windows overlooking the River Thames. The Oyster Bar with its huge crystal chandelier takes centre stage. Kaspar’s speciality is seafood but you can also enjoy steak and burgers all washed down with a glass of champagne. Simpson’s in the Strand has recently reopened its doors after a huge restoration. This is one of London’s oldest and most famous restaurants and the menu includes many favourites from British cuisine, including their world renowned Roast dinner where the meat is carved in front of you on a trolley. The Savoy Grill by Gordon Ramsay is probably where I first experienced pure luxury dining and past guests have included Winston Churchill and the Queen herself. You can find the Grill on the north side of the Hotel, just to the left of the entrance as you walk into the Hotel itself. It recently had a facelift and the designer, Russel Sage, restored the restaurant to its original Art Deco style and seating plan. 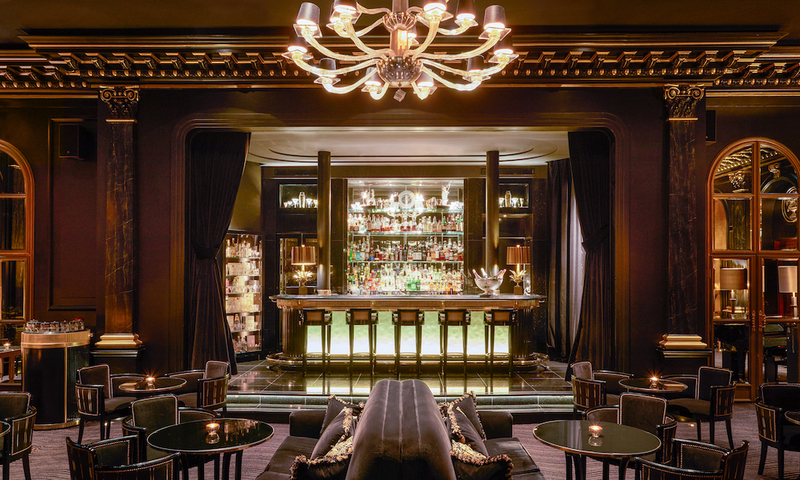 It is pure glitz and you can just imagine Frank Sinatra sipping his whiskey on the rocks at the decadent bar. The menus are once again inspired by our rich British culinary tastes including British Beef from the wood charcoal oven, seafood ravioli with lobster vinaigrette and glazed Cumberland sausage with creamed celeriac and crispy shallots (or just a posh version of sausage and mash to you and me 😊 ). It was in this very restaurant that I ordered Hereford Beef sirloin steak and asked for it to be medium rare, in which Mr B later told me, I knew then that you would be the woman that I married! We then ventured on to one of my favourite places to get a cocktail, the American Bar. It is so named because in the late 19th and early 20th centuries, London saw a boom in “American Bar’s” opening up in the city which served American drinks, or cocktails. The American Bar in the Savoy is one of the oldest surviving cocktail bars in the world and repeatedly wins awards, including the World’s Best Bar in 2017. Here you can drink cocktails including “Club Rags” which is made up of Patron tequila, pickled orange, lime and Hibiscus agave and is inspired by the photo that adorns the American Bar walls of Paul McCartney singing and playing on the piano at Ringo Starr’s wedding in the London Club Rags. In fact, the walls of the American Bar are adorned with numerous black and white photos of famous personalities, all taken by the photographer Terry O’Neil and inspire many a bespoke cocktail. You don't want to drink too many of these! The Beaufort Bar has a beautiful Art Deco design and has a very moody feel to it, with dimly lit chandeliers and dark velvet and golden leaf interiors. The bar itself stands on a stage, where cabaret acts use to perform, and the Savoy have recently introduced monthly cabaret and burlesque nights where you can choose a cocktail from the world class Mixologists or champagne from their extensive list. After our night out at Mansion House, we popped into the Beaufort Bar for a glass of champagne and then retired to our king size bed, ready to try out the spa facilities in the morning. After a fabulously tasty full English breakfast at Kaspar’s, we headed upstairs to the Beauty & Fitness Area for a quick swim. It has a 10m swimming pool which is found in its own atrium with light filtering through the ceiling high windows, a sauna, steam room and gym. It also offers treatments such as the deep cleansing facial or a couple’s harmony massage (which we passed on, I can’t think of anything less romantic than someone else giving me a massage with Mr B lying next to me. I think we’d laugh throughout!) We then had a last wander around the Hotel, including the Savoy Tea Store in the Upper Thames Foyer and Boodles jewellery in the Savoy Front Hall. The Savoy Hotel is definitely somewhere you go to enjoy the experience of staying in a 5 star Hotel and not just somewhere you go to get your head down on a trip to London. In fact, the Savoy is full of visitors and tourists alike, taking in the beautiful décor and world class bars. It was far from pretentious, all the staff were genuine and it felt like they really were interested in where you had come from and why you were staying. The accommodation was spacious and clean and the amenities plentiful. It is worth every penny and I can’t wait to stay again.